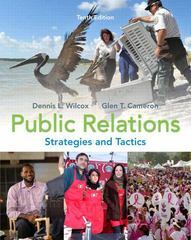 Public Relations 10 Edition Updated in a 10th edition, Public Relations: Strategies and Tactics, Tenth Edition, clearly explains to students the basic concepts, strategies, and tactics of today’s public relations practice. This comprehensive text is grounded in scholarship and includes references to landmark studies and time-honored public relations techniques. The tenth edition emphasizes the application of the Internet and social media for programs and campaigns.